“Death is nothing at all. I have only slipped away into the next room. I am I, you are you, whatever we are to each other; that we still are. Call me by my old familiar name. Speak to me in the easy way which you always used. Put no difference in your tone; wear no forced air of solemnity or sorrow. Laugh as we always laughed at the little jokes we enjoyed together. Play, smile, think of me and if you want to, pray for me. Let my name be ever the household word that it always was. Let it be spoken without effect, without the trace of a shadow on it. Life means all that it ever meant. It is the same as it ever was, there is unbroken continuity. Why should I be out of mind because I am out of sight? I am waiting for you, for an interval somewhere very near. Just around the corner. All is well”--Henry Scott Holland. Baba at exactly a month to his death welcoming Pastor EMF Oschoffa to the Jesus @ Golgotha Adult Harvest 2013. 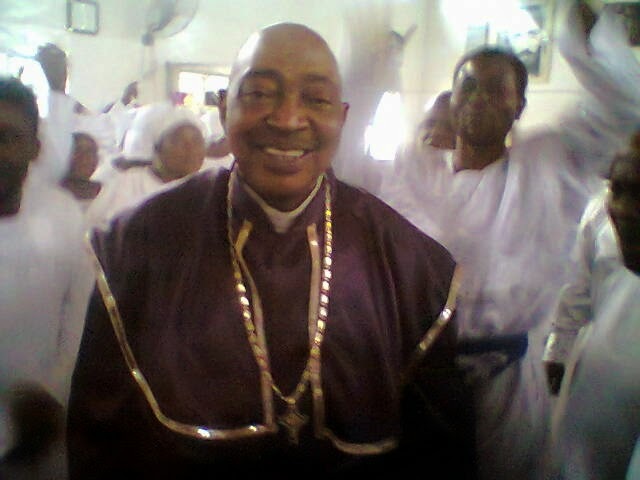 The aforementioned words of Henry Scott Holland could only mean the soothing balm that could heal the shock mixed with anxiety and bitterness of heart that hits the hearts of many Nigerians especially members of the Celestial Church of Christ (CCC) Calvary Parish 1 Ogba Aguda, Lagos in the early hours of Sunday, January 12 when calls started hitting their phones that their great Shepherd, Superior Evangelist (Dr.) Joshua Akande Ogunorunlayede (CMA, ELMA, GCHSA, JP) has passed unto the great beyond. The bitterness of mind was precipitated on the fact that the 72 years old shepherd of one of the biggest parishes in the Celestial fold was an embodiment of humility and mercy while he was alive and many of his flocks loved him to bits; shock because, the man of God never showed any sign of sudden death in the early part of the year before his demise at 10:40pm on Saturday January 11 at a private hospital at Ifako Ijaiye area of Lagos, South West Nigeria. During the last two services that heralded the new year which is the Cross-Over Service of December 31st 2013/1st of January 2014 and the New Moon Service (A spiritual service of the Celestial faithful which comes up every first Thursdays of the month) of January 2nd 2014, Ogunorunlayede had danced religiously and celebrated amidst praise worship songs by the church choir and went ahead to give a prophetic sermon which was delivered with lots of enthusiasm and happiness on his face. But not until his sudden demise on January 11 did many faithful started reading meanings into some of his actions in the last one month leading to his death as it became evident that the man of God probably had premonitions of his own death. 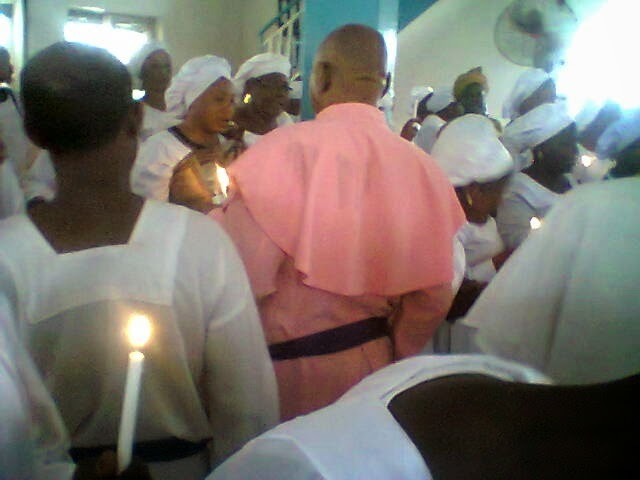 For instance during the new moon service of Thursday January 2nd inside the Ogba Aguda cathedral of the church which has six annex parishes in Lagos and Ogun state, while he was about delivering his sermon around 12 am in the early hours of the day, the man of God had called unto some wandering members of the church who are in the habit of moving around the cathedral when the word of God is being delivered, he yelled at them and said “E wole wa, Aja loma ngbeta, o le je eleyi la ma’a so, ta’a ni le so mi mo” (Come into the cathedral and listen to the word of God; it is a dog that stays outside; this might be our last chance to talk to you like this”). 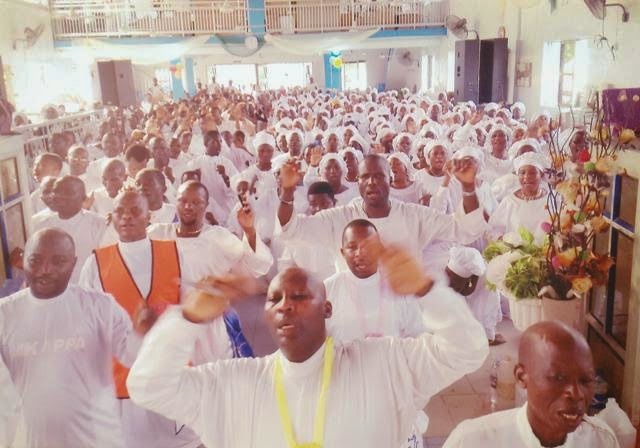 This and many other actions were catalogued in the minds of the over three thousand members who throng the church premises on Sunday January 12 to do two things; console the family of the shepherd and render worship to God Almighty. The service which was directed by one of the church elders, Senior Evangelist Kayode Ajala drew lots of faithful to the premises; they shed tears and also sang in memory of their beloved shepherd but were quickly motivated out of fear by words from the council of elders of the church through the secretary of the church Evangelist Obadiah Akanbi Abioro. There was also a strong worship hour demonstrated by the church choir as they delivered soul moving hymns that elicited nostalgic feelings of the late man of God coupled with a very powerful and soul searching sermon which was equally delivered by one of the leaders of the church Honorary Most Senior Evangelist J.O Folarin (JP). 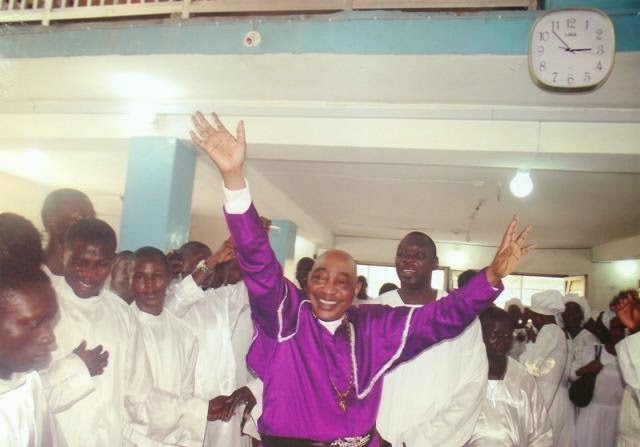 Baba Ogunorunlayede in a joyous mood with worshipers. Scene 1, Act 1: He died one year after his wife departed! One of the most shocking episodes of the demise of Papa, Superior Evangelist (Dr.) Joshua Akande Ogunorunlayede on Saturday January 11 was the reality that the man passed away exactly one year after his first and elderly wife passed on at age 68. 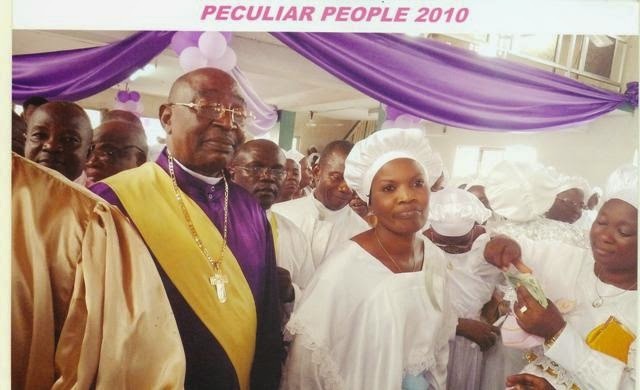 His elderly wife and mother of his eldest children, Mother Celestial Felicia Abegbe Ogunorunlayede passed on January 22nd 2013 at the hour of 11 am at age 68 while her husband passed away on January 11 2014 at the hour of 10:40pm at age 72. The two died at the same hospital, Veritas Medical Center, Ifako Ijaiye, Lagos, South West Nigeria. Before their demise, although the man of God had a surviving young wife, Madam Olufunmilayo Ogunorunlayede who bore him 4 lovely children but his love for his first wife who gave him his first 5 children among which is a shepherd, entrepreneurs and business enthusiasts, was said to be very strong as they shared some of the best moments of life together. They both visited Israel 8 years ago and also visited London for ministerial assignment couple of years back. 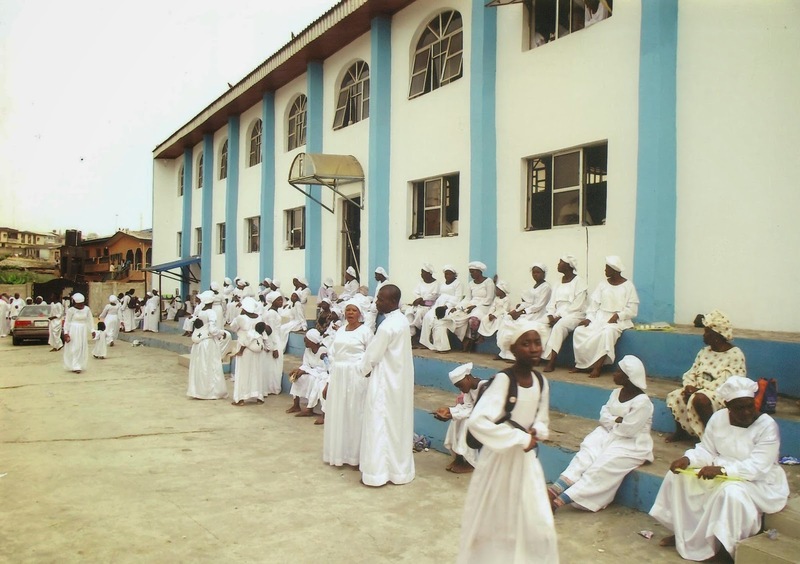 The church which is famously known for strong spiritual works marked with signs and wonders, has six parishes which are CCC, Calvary Parish 1, Aguda-Ogba; Lagos, CCC, Calvary Parish II, Akute Ogun state; CCC, Calvary Parish III, Itele Road, Ota, Ogun State; CCC, Calvary Parish IV, Idi-Eme, Ogun State; CCC, Calvary Parish V, Old Akute Road, Obawole and CCC, Calvary Parish VI, Olowora, Isheri, Lagos. He is the founding Shepherd of all the Calvary Parishes of the Celestial Church of Christ. 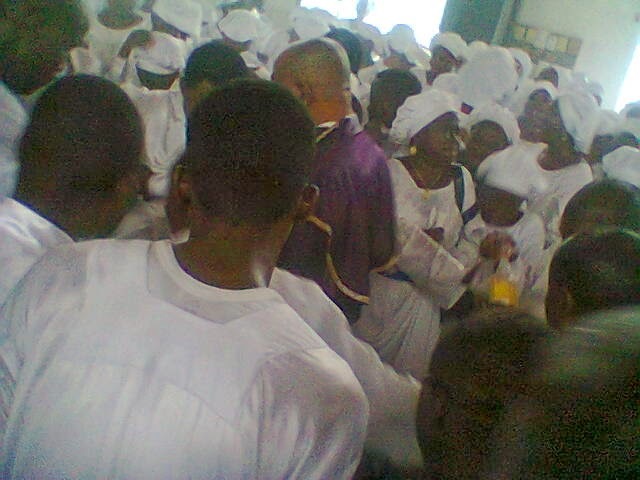 Mass of faithfuls at one of Baba's revivals. Scene 1, Act Two 7 Mysterious things he did to show he knew he was going. When asabeafrika paid a visit to the Church premises penultimate Wednesday morning after the Dew of Harmon Service (Mercy Hour service) which took place around 9 am with many parishioners attending, some faithful who spoke to this blog felt their shepherd had a strong premonition of his demise to the great beyond hence he carried out some last minutes actions that were indicative of his intention. First was the issue of the theme for their 33rd Adult Harvest Anniversary which takes place every first Sundays of December. The last harvest (33rd Adult Harvest) on December 1st 2013 was invariably tagged “Jesus at Golgotha” by nobody than the shepherd himself. 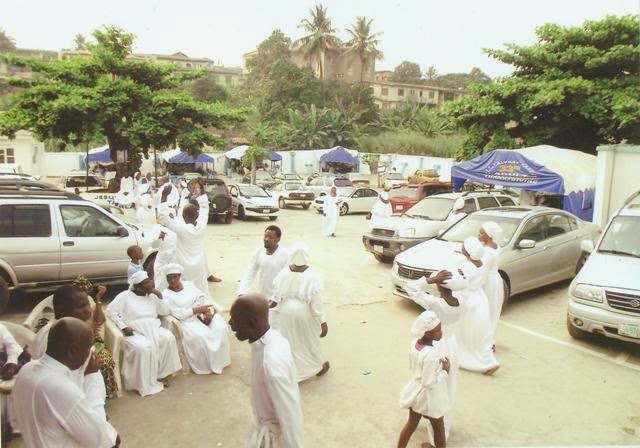 According to information at asabeafrika’s disposal, when the adult harvest anniversary committee was looking for a theme to give the 33rd harvest celebration, they consulted Baba (Ogunorunlayede), but Baba was said to have told them to give him some days to reply them as he needed to consult the Holy Spirit. But on returning to him few days later, the late shepherd was said to have handed them the theme “Jesus at Golgotha” which many of them found very funny and disturbing but couldn’t reject their shepherd’s wish. As one of the youth leaders in the church Mr. Seye Popoola pointed out to this blog “Yes, we were particularly not in agreement with that theme because Golgotha was where Jesus finished his earthly ministry and he said “It is finished”. Golgotha to my own understanding is associated with sorrow and we had no reason to have brought it close to a harvest anniversary ceremony where we are expected to dance and rejoice. But as you can see, the man had his own peculiar interpretation. He was a great man, he saw it coming but he didn’t want to make us jittery. He was only telling us that he was going after finishing his own 33 years of evangelical works on earth”. Worshippers mourning Baba on January 12, 2014. During the 2010 adult harvest, the man of God gave the theme as “The Peculiar People 2010”, in 2011, he tagged it “Eternal Rock of ages” in 2012, he tagged it “Come unto Me” and last year, 2013 he tagged it “Jesus at Golgotha”. But few days after his departure to glory, some of his aides discovered a mysterious diary inside his office where he already wrote the theme for 2014 titled “The kingdom of Priests 2014” with reference to Hebrew 4:8-16. Now, every one that read that portion of the Bible which spoke about dying and resting with Christ in heavenly glory were double sure that the late Superior Evangelist (Dr.) Joshua Akande Ogunorunlayede was given the clairvoyance of the Biblical Prophet Elijah who was enabled to have a fore knowledge of his ascension unto glory. These and many other mysterious things confirmed the greatness of the man. Secondly, he was said to have attended the yearly Celestial Church of Christ Holy City Program at Imeko, Ogun state on 24th of December 2013 and had demanded to see the Pastor Emmanuel Mobiyina Oschoffa before leaving. 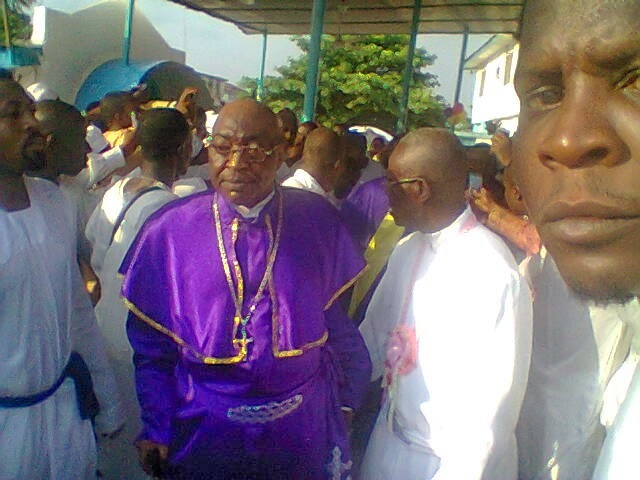 Although the same Oschoffa had graced Ogunorunlayede’s 33rd adult harvest on the first Sunday of December 2013 but he was said to have insisted on seeing the Pastor for the last time. Ogunorunlayede was unable to see Mobiyina on the first day of the service (24th) until the second day (25th) when he was able to meet the Pastor face-to-face and had a private encounter with him “After seeing Baba (Ogunorunlayede), the Pastor (Mobiyina) refused to see any other guest again” scooped an aide who was privy to the Imeko meeting. The aide said further “The first day, we couldn’t see the Pastor and this man (Ogunorunlayede) slept on the bench with all of us after the service; he was upbeat till we saw the Pastor. Thirdly, he also started watching tapes of the miracles performed by the late Pastor founder, SBJ Oschoffa throughout the journey and even when we returned to Lagos, he busied himself with those tapes. Fourthly, after seeing Pastor Mobiyina Oschoffa, he visited the late Pastor founder SBJ Oschoffa’s grave and prayed for a long while before we departed for Lagos. After that encounter, he was so full of joy and we couldn’t figure what was responsible for his upbeat mood”. Fifthly, he also changed the entire furniture at the Church’s vicarage and also demarcated the property of his children off the cathedral building. All these he did within a month to his demise. Sixthly, he was said to have visited his CCC, Calvary V, Old Abeokuta Road, Obawole for the adult harvest anniversary, something he has not done in the last six years. Baba during another revival in the last weeks before his demise. Scene 4, Act 4: Drama and dynamics of his last moment. Ogunorunlayede’s last moments were full of drama as well as suspense. One of his aides revealed more “He was in church on the 31st as he conducted the Cross over service with lots of music, joy and enthusiasm. He was one man who rejoices at doing revivals; he enjoys Celestial hymns, perfumes, incense, and the revivals. One of his hobbies is to sprinkle expensive perfumes on his flocks and rejoice with prophets and prophetess. He did all this on that night with so much enthusiasm and gusto; he equally delivered the sermon which was quite revealing. On January 2nd during the New Moon Service, he did more than what he did on the Cross Over Night. Everything he did during the cross over night, he did double during the New moon service of January 2nd. He danced to the extent that people were worried for his health because he is advanced in age and it is not new for him to fall ill at intervals and come back on his feet. At a time during that service, he took over the microphone and was dishing out Celestial Hymns to the choir; he practically took over as the Choir Master. He also poured so much perfume on the flocks. It was a great celebration. But the odd moment came when he was about to preach, while on the podium, he charged everyone to come into the cathedral and warned them that this might be his last opportunity to speak with them. He equally lashed them that it is dogs that stay outside when the word of God is going on, not men”. “That actually turned out to be his last sermon. On Friday, 3rd January he was rushed to the hospital. It was a very bewildered church that was told on January 5th (First Sunday of the Year) that their Shepherd-in-charge was on “Bed rest”, that was never a challenge as they knew the man was advanced in age and had always gone on bed rest from time to time. From Friday 3rd he was placed on drip until Wednesday, January 8th when it seems his health was improving and some of his aides, children and grand children visited his bed side and were elated to see a glowing man, smiling to everyone in sight”. The aide concluded. “He couldn’t really talk since January 3rd when he was rushed into the emergency space of the hospital. But like late Nelson Mandela, Baba couldn’t talk but he related with his eyes; if you open the door, he will smile at you and that showed he recognized you” revealed another source to this blog. According to further information, all the visitors to the hospital soon departed home except his young wife, Lady Funmilayo Ogunorunlayede who did all the clean ups and stayed with him. All this time he was said to have lost his voice. Thursday and Friday, he was in a deep sleep but on Saturday 11th, things changed as the Veteran man of God was prepared to go home, his body was said to have suddenly changed with his breathing becoming difficult and by the time medics were called in to stabilize him he passed away. Few minutes before then, he was said to have recovered his voice and shouted “Halleluyah” for some minutes before he slumped back and went into deep coma. One very significant mystery that was recorded at the hospital was the fact that public power never seized since he was admitted, but immediately he breathed his last, the power went off and it remained so till his body was evacuated to the mortuary. asabeafrika spoke with some of his aides who have worked with him for long years, one of them is Superior Wolider Ranti Ojewole who described the late Ogunorunlayede as a great teacher of the word who never did anything without spiritual ordinance. 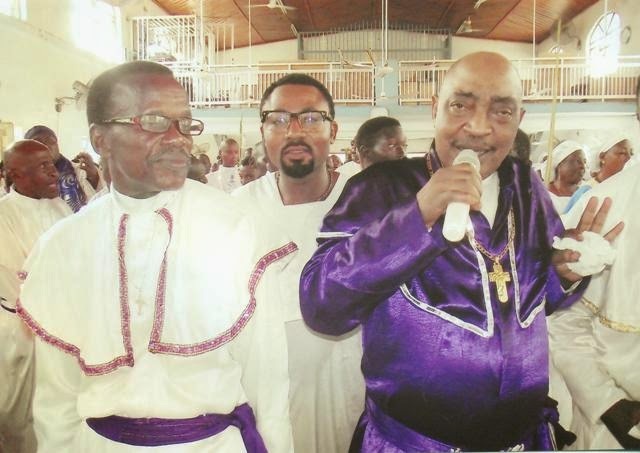 “He is my ultimate spiritual father” claims the Awe, Oyo state born Man of God who has worked with Ogunorunlayede for 18 years. Prophet Ranti recalled one of the interesting moments which defined his relationship with his late boss and remained indelible on his mind “That was the experience that led me into my first trance in this church; I had always wondered what the source of the man’s power is. So, one day, he sent me to his bed room to get something for him and to my surprise I saw many portraits of Jesus Christ (Pictures) surrounding his bed. But I was not still sure, the portraits were many and as I was still trying to look around the room and see if I can get any incriminating thing to assuage my suspicion about his source of spiritual power, those pictures came out and became flesh and I was encased with great fear. Suddenly I staggered and lost control, I was terribly wounded and I never knew what happened again. I went on trance. Until the 8th day, when the spirit of God interpreted what transpired to me; I was told that the power I am trying to search for is what actually came out and that power is Jesus Christ; that Ogunorunlayede uses no other power than that of Christ and since I was trying to find out his source of power, it was revealed to me with a gift of prophecy. That experience was quite revealing for me and till date, I revere the experience because it changed my belief about him totally. I have never met a man like him since my sojourn in the Celestial fold and we might need to pray to get such a man again”. 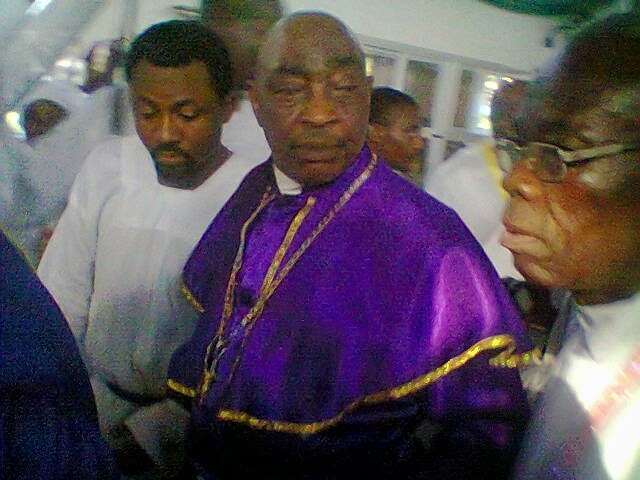 Baba during one of his sermon in 2013 with his aides. Assistant Evangelist David Orisunmibola in his own word described his boss of over ten years as a man who cannot die even if his body dies “when Papa Oschoffa died in 1985, many of us thought Celestial Church would come to an end but instead the church even became stronger and spread to places we never thought it could get to; even places Oschoffa himself never visited, CCC got there. If you look at Ogunorunlayede, he is equally like that, many Calvaryians might think this is the end of this unique ministry but I can assure you miracles just started afresh here. Right now, Ogunorunlayede has joint the saint triumphant for a life of bliss but his work of faith will become stronger because when Jesus departed, his gospel grew. When Papa Oschoffa departed, his calling expended. Calvary Parish will experience the same”. Orisunmibola who also witnessed some of the last minutes of his boss gave us another shocking drama that characterized those last moments “In the morning, he will wake up to the music of Jim Reeves and when the track “I will fly away to glory” come blaring, his mood will change and he will stand and start dancing with great enthusiasm and at that moment, nothing you say to him matters”. Evangelist Dave Memeh from Delta state remembers his boss of 18 years as a man rooted in truth and the spirit of God “He is full of spirit and will never do anything except God tells him to do so. He is humorous, a great evangelist and philanthropist. He is a man who can lay down his life for you to achieve anything” Dave Memeh gave us his own unique experience with the late clergy “You can’t lie to Baba. If you lie to him today, tomorrow, you will go and tell him the whole truth because you won’t be able to sleep. He will tell you he has accepted but your inability to sleep will make you to go and tell him everything. He is a thorough leader who despises lies and insincerity. He will never lie to you and he dislikes lies as well” Evangelist Dave Memeh who was on the last trip with his Baba to Imeko last December confirmed all his aforementioned action at Imeko. 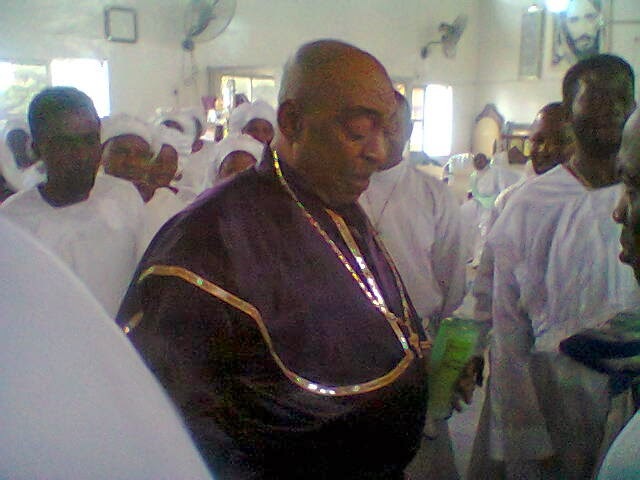 Superior Wolider Dimeji Jaiyeola aka Ustadhs who changed from his Islamic faith to Christianity said it was Baba Ogunorunlayede who gave him the peculiar assurance that Christ is the light. The Abeokuta, Ogun state born cleric who has spent 8 years with the late founder of Calvary Parish said “Ogunorunlayede is a shepherd of shepherds” “when I came onboard I would have gone back into Islam but his humble attitude to leadership is what kept me here till now. He was a man who lived by his words. If a quarter of Celestial shepherds could be like him, Celestial Church would have been the greatest church in the world. I have worked with many spiritual leaders but only few can display the kind of faith Ogunorunlayede displays; he sits at his duty post and never travels like some other church leaders; he will tell us, anything God cannot give me on this seat, let Him keep it to Himself. That is one of the qualities of a genuine man of God; they leave everything to God. He is a symbol of faith”. 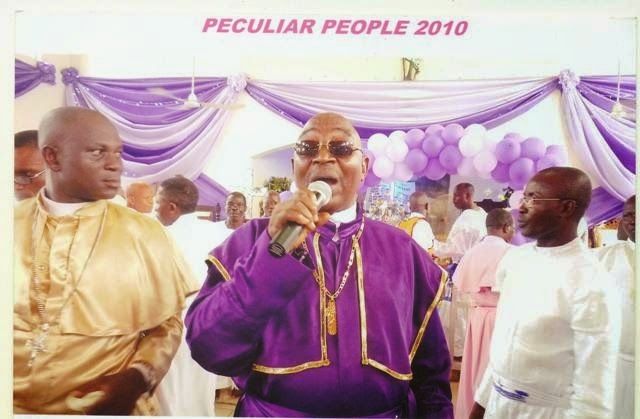 Evangelist Olujimi Adisa who is the Chairman of the side men/side women in the church describe Akande Ogunorunlayede as an “extra –ordinary leader” “He is someone who believes that what he says would come to pass. He will never do anything God didn’t ask him to do. He is a peculiar leader; one in a million. He hates lies and liars; he loves truth and he lived for the truth. You can’t see a parish like this elsewhere. He was a democrat; you don’t even need to see him before you get solution to your spiritual problems here; he already created a system that works. The Calvary Parish modem with our White Angel Consultation Arcade and the seven wise men (spiritual tables) or Shepherd Assistants’ tenth is a master wonder of the Holy Spirit in this church. Many Nigerians even from the Pentecostal churches and Muslim faith come here on a daily basis for spiritual consultation and they get results because our prophets who are constantly on trance will tell you the real truth about your condition and you will be set free. That is one great legacy Ogunorunlayede left behind”. Baba during one of the New Moon Services in 2013...blesing his flocks. 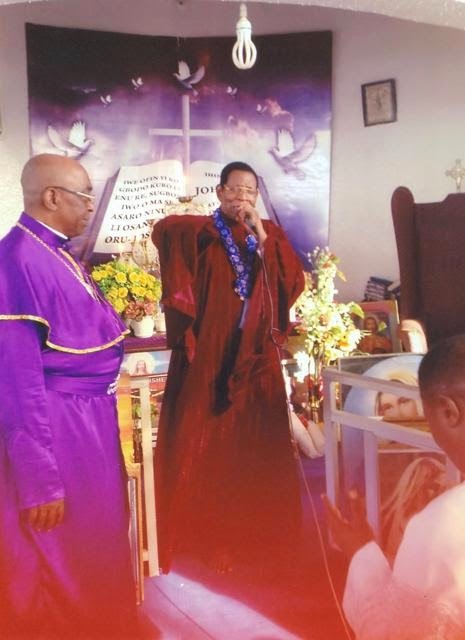 Baba during the last harvest 'Jesus @ Golgotha with Pastor EMF Oschoffa. Evangelist Obadiah Akanbi Abioro is the secretary and Chief Information Officer of CCC, Calvary Parish 1, he told asabefarika some of the things he knew about his late boss and also reacted to fears about the greatness of the church after the shepherd’s demsie “You said I should define my late boss, a simple definition might not be enough for Pa, Superior Evangelist (Dr.) Joshua Akande Ogunorunlayede because he was a man of many parts. And for the fact that in whatever he believes, he follows it to the logical conclusion; I will rather say he is indefatigable because he was never tired in his works in the vineyard for 33 years”. On what he learnt from Ogunorunlayede’s life style, the Shawonjo, Yewa North, Ogun state born clergy spoke further “Here was a man who personally believes in prophetic utterances; if he wants something, prophetically he says it and he would continue to tell you that Jesus would do it and you will see the thing come to pass. 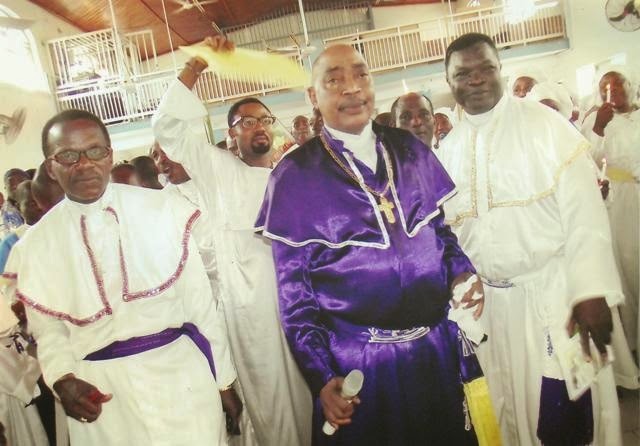 He is an unalloyed Celestial tenet loyalist” Evangelist Abioro who has been working with the late shepherd officially since 1998 after meeting him in 1985 confirmed the founding of a secret diary inside his office with a theme for 2014 adult harvest inside it. But does he suspect that his late boss knew he was going to die? Abioro reacts “As a strong man with lots of followers, in spite of the fact that he received heavenly hosts as guests yet he prevented people from getting frightened; he presented himself as somebody who is just ill but for a while and true to it, it was for a while because he is hale and hearty now in the bosom of Christ Jesus”. On the major fear that the church could be taken over by forces from the National Headquarters, Ketu who might not understand the dream and vision of the builder and thereby deplete the strength of the church, Abioro thought for a while before giving an answer to the question “What you just asked me is a very big question but I will equally give you a big answer, a big question in the sense that Baba’s activities transcend all human endeavors. To sustain his legacy, we must go back into the spirit and consult in order for us to get the best direction on how to sustain his special spiritual legacy. We must equally imbibe his attributes such as love, sincerity, concentration and faith that used to be his own pivot. Having put all these in place by all of us that are spiritually born by him in Calvary Parish especially the re-constituted Council of Elders which he did few weeks before his demise, God being by our side, we have nothing to fear. His foot print in the sands of time will be adequately protected”. The very lettered Abioro concluded. Baba in the midst of his flocks...blessing them. My Father has run a good race---son, Kayode Ogunorunlayede. His first son, Special Apostle Kayode Ogunorunlayede who is the Shepherd-in- charge of CCC, Calvary Parish III, Itele Road, Ota, Ogun state who was busy receiving guests from all parts of the world on the day we visited was full of emotions when he spoke to asabeafrika “I am full of gratitude to God for your presence here, it only showed that my father touched so many lives in his short term on planet earth. He was a very brave man, a strong father, shepherd and a visionary of sort. My father was a dreamer and like it was said in the book of Habakkuk 2:2-3, it says “then the Lord answered me and said ‘write the vision and make it plain on tablets, that he may run who reads them. For the vision is yet for an appointed time; But at the end, it will speak, and it will not lie. Though it tarries, wait for it. Because it will surely come, it will not tarry”. When my Father the late Superior Evangelist (Dr.) Joshua Akande Ogunorunlayede stormed this swamp with my mother and some of us in 1980, we thought he was crazy, we were practically living with snakes, monkeys, wild birds and all sorts of animals but in 33 years, look at what the man did with his vision. Today we have Calvary Clinic for our pregnant women, White Angel house for spiritual consultation, Calvary fountain for water baptism and even the seven elders table (Shepherd Assistants) that helped my dad run the affairs of the church in his life time. Last year we lost my mum and this year we lost my dad, we have equally contributed our quota to kingdom heritage and I am proud to tell you that the man you came here to ask about has gone to rest with the saints. He has run a good race and he is there with the saints. We have never stopped receiving guests from all over the country here, you can check our condolence register and you will be shocked with the caliber of people that are trooping in to celebrate with us; don’t mourn my father. Let us celebrate him because he died an accomplished Christian and kingdom builder. He ran with the vision at the appointed time and his legacy is large enough for us to roll by. I was just thinking of posting my comment because i know a bit about the man before he passed away. A sister of mine who had problem with her husband who nearly divorced her as a result of in-laws induced problem got her miracle after visiting Calvary Parish. The late Ogunorunlayede believes in prophecy and prayer and that is why his church among the celestial fold remains the biggest. Debari. I just hope the man will sit beside Father Abraham with the kind of testimonies people are giving about him. Anonymous. So what else do you think will happen to such a man of God, of course God will grant him access to his bosom, he merited it. He was a JUSTICE OF PEACE. I just pray he remained one of the distinct Celestians before he was called home. Anonymous. There is nothing to prove again than the fact that the late Celestial Leader died knowing well that his time was up. The stories told by his aides is very mysterious and we just need to appreciate God for making him to live such a good life. If all Celestial leaders could be like him, at least from what many people said in this piece, the church will be great and better than any church. Anonymous. I like what the last post man said about the Celestial Church man, because i know of few Redeemed Christian Church of God and even Four Square Church member who went to Calvary and they got their spiritual problems solved. So, we shouldn't discriminate. Anonymous. Yes o. i believe in mysteries o. This man is a real mysterious man o. The man even try, say e no marry plenty women. Na just two. That really show say im be Abrahamic Pikin. Our Baba Abraham for Bible no marry plenty, na just two im marry and the thing sweet am well. 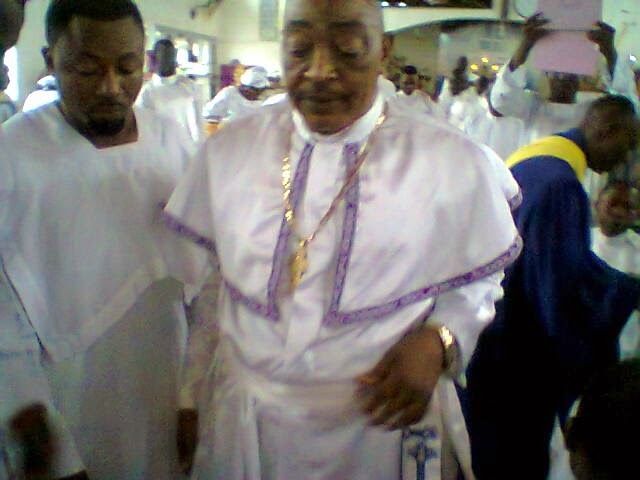 I have just gotten wind of the demise of Papa Akande Ogunorunlayede on asabeafrika.blogspot.com. I am very happy the way the blog blew the whole episode of his death open; the trajectory of his life and demise is a great stuff for movie. I am bold to say that i know the man, Joshua Akande Ogunorunlayede. He is a very great man and i was one of those who benefited from his spiritual benevolence when he was alive. I visited the church on several occasion and i can tell you that CCC Calvary Parish is the most democratic church. If you go there, you just buy a candle, offer your prayers and a prophet will minister to you and tell you everything that is going on in your life. After that you might be requested to do some special prayers and it is there you will see the human face of the church. They wont tell you to go bring some outrageous sums of money. You just need to do your prayer with the money in your pocket and you are even going to be the one spending it, not anyone else. That is why many people who got their miracles after visiting the church dumped their former church that couldn't give them value for commitment. What a grand talk about Baba Akande Ogunorunlayede; i was at Calvary yesterday and i was so amazed with the kind of people that crowded the church. I think even in death, the man is still pulling crowd. His is a genuine work in the sight of men and the sight of God. Adie! Great Man of Celestial faith. Momodu D.
I want to salute this blog, www.asabeafika.blogsopt for bringing us this very interesting news about the late man of God. This is the real news and this is something close to tabloid journalism. We need not to go too far to search for anything good about the man again as we already have it here. I will make sure i touch Nigeria on Friday May 1st to honor his funeral. I will because i know the man well. Laba-Ekun.